I'm so excited that my husband and I will be able to take our children to this Fantastic Event! Everyone loves the magic of Disney and to be able to have to take my little ones to see their favorite characters put on a show is going to be a wonderful family experience! Are you in Utah and interested in taking your Family to see Disney's Magic? If so here is the information on the performance, schedules and a special discount code for you readers! Tickets are on Sale now so get yours before they are gone!! 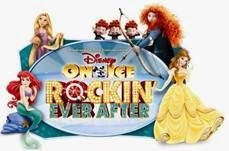 And I have a even better thing for you guys, I've been lucky enough to be able to Giveaway 2 tickets to Disney on Ice Celebrates 100 Years of Magic to one of you lucky readers!!!! I will choose a winner October 27th at midnight (via random.org) and you will have 48hrs to email me back! Good Luck!! That is my birthday weekend so I would LOVE to take my husband and daughter!!! My favorite disney character is Goofy. I would take my niece to the show with me.